Watford host Manchester United in the Premier League on Tuesday night. Will the Hornets make the most of the Red Devils’ away-day blues? 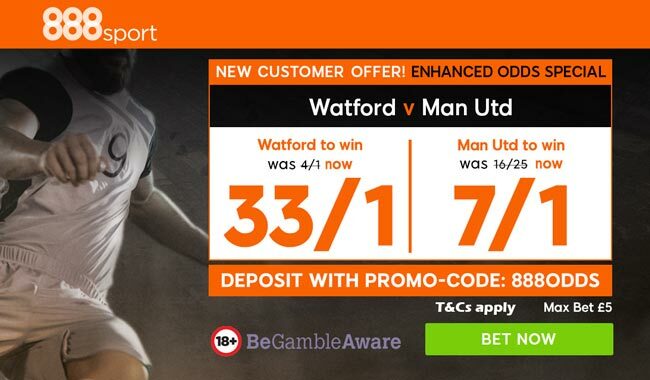 Read below our Watford vs Man UTD betting preview with predictions, betting tips, starting lineups, team news, enhanced odds, bookmakers offers and no deposit free bets on this week's Premier League games! Troy Deeney is available again after serving a three-game ban while Miguel Britos and Kiko Femenia are both doubts for the Hornets. Marvin Zeegelaar's form may keep Jose Holebas out, with in-form Will Hughes also expected to retain his starting berth in midfield alongside Aboulaye Doucourè and Roberto Pereyra. Up front, Andrè Gray should continue to lead the line, with Richarlison tucked behind him. In defense, Sebastian Prodl, Chrstian Kabasele and Adrian Mariappa are likely to defend Heurelho Gomes' posts. Younes Kaboul, Craig Cathcart, Tommie Hoban, Isaac Success, and Nathaniel Chalobah all remaining injured. Manchester UTD made it 10 wins out of 10 at Old Trafford on Saturday with a hard-fought 1-0 win over Brighton, courtesy of an unfortunate Lewis Dunk own goal. A win is a win though, and it kept The Red Devils 2nd in the Premier League table. Anyway, they have tasted defeat on three of their last four road trips in all competitions, including their last two Premier League away fixtures at Huddersfield and Chelsea as well as a Champions League clash in Basel. The Red Devils have won 9 of their last 10 matches against Watford in all competitions but lost e lost 3-1 in this corresponding fixture last season. Centre-backs Eric Bailly and Phil Jones are still doubtful, meaning that Josè Mourinho could play with a three main backline formed by Marcos Rojo, Chris Smalling and Victor Lindelof. The likes of Matteo Darmian and Daley Blind are likely to start as wing backs of the 3-5-1-1 system, meaning that Ashley Young and Antonio Valencia will be benched. Major changes are also expected up front where Marcus Rashford and Anthony Martial are likely to be rested, allowing Juan Mata, Henrikh Mkhitaryan or Zlatan Ibrahimovic to support a struggling Romelu Lukaku in attack. The Belgian striker might also be handed a three-game ban that would see him miss a top-of-the-table clash with Manchester City at Old Trafford next month. Ander Herrera, Pual Pogba and Marouane Fellaini are expected to start in the middle of the park, with Nemanja Matic as further option. "Watford vs Manchester UTD predictions, betting tips, lineups and odds (Premier League - 28.11.2017)"